StrainDAQ is a comprehensive, user-friendly data collection software package developed for laboratory and field testing and analysis. 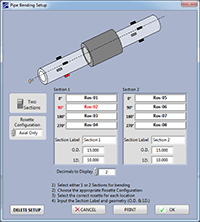 This versatile software supports a variety of sensor inputs (i.e., strain gage, voltage transducer, current transducer, thermocouple, etc. ), and makes it simple to setup, calibrate, and measure for each input type. Menu-driven instructions allow for quick hardware and channel set up, testing, and data post-processing. With StrainDAQ, users are able to select specific input channels to acquire data, plot, display, and even store for future test runs. Data is stored in a binary format and can be exported as ASCII files. StrainDAQ also automatically corrects for Wheatstone bridge nonlinearity, transverse sensitivity (when applicable), and calculates temperature-induced apparent strain values. In addition, the acquired strain values for single, biaxial (Tee), and triaxial (Rectangular and Delta) rosettes can be reduced to principal stresses, stress orientation (Phi), and equivalent stresses (von Mises failure criteria). The data reduction can be performed in “real-time”.